All those pieces of plywood that have been on the old Design Lab floor for a week and a half, are starting to come together into a physical object that might be useful. Just as the tables came together from plywood and 2x4s, and as the sawhorses took shape on a lunch hour, a couple of open class periods served to transform these bits of plywood into a bit of shelving, which will eventually ride on four casters, and will travel from classroom to classroom, or just around the new Design Lab. When I was cutting the plywood, it was easy to praise my work as highly successful, and note how straight and even my cuts were. Now that I’m assembling, I have to say — I’m not as good as I thought I was. I’m good, but I’m not that good. The design of the cart is not mine, either, and I’m not sure that I’d have thought of it even if I had needed to design it. All of the parts are cut from one of two sheets of plywood, either one or the other; and assembled with a combination of glue and screws or pneumatic nails. Which means that I had an excuse to break out the clamps and the wood glue. This was a completely new process to me. I’ve glued papers together before, and bound plastic, but binding wood together with glue (and then screwing for extra strength) was new to me. It was both satisfying, but also slow — I have enough clamps to do two narrow shelves at a time, but only one of the wide shelves at a time. 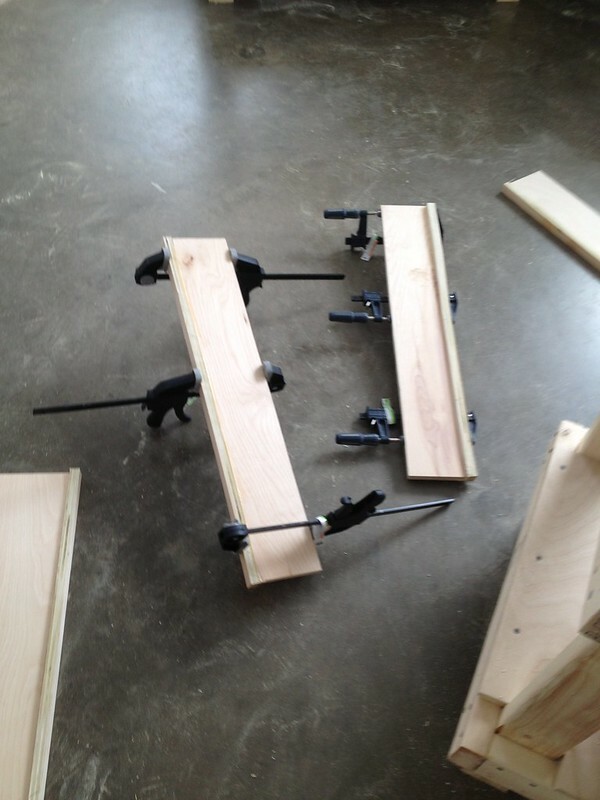 And of course, in the process of clamping and gluing these shelves, I discovered how uneven some of my cuts were. And how non-flat some of the plywood was. And how warped it was, too. And how wood can be sometimes forgiving of mistakes, and sometimes quite unforgiving. My respect for professional carpenters is renewed. How could it not be? I mean, there are professional carpenters who make mistakes of less than 1/32″ of an inch, and joiners and cabinetmakers have even narrower tolerances; and fine box-makers and machinists can turn pieces of wood into beautiful and elegant objects that move and breathe with changes in humidity and weather, swell and contract in response to changes in temperature, and all sorts of sophisticated stuff like that. What can I do? Leave 1/8″ gaps between boards. All the same, by the end of the day I had the H-frame of the center board and the two end-boards assembled. The H-frame was attached to the base. The base had the structural supports for the wheels attached. There were four narrow shelves in place on the narrow side of the cart (rather than narrow shelves on the wide side of the cart, if you see my point). To build this far required my trusty speed square, a bevel square, a long level/straight edge, a power drill, a box of screws, a hammer (to help persuade the shelves to lie in the right places), ALL of the clamps in the design lab, including the spring clamps, a pencil, and some other miscellaneous knickknacks. It feels like a feat of engineering is being accomplished. And this is the most complicated piece of wooden furniture I’ve ever assembled. Flatpack IKEA stuff doesn’t come close. Casualties included two drill-bits, which snapped off during the process of drilling pilot holes, and my pride and ego at thinking I was such a great sawyer of plywood. Also, of estimating what was actually level. It’s a good thing I had several different sizes and lengths of level, because otherwise several measurements in this cart would have been off kilter, significantly. Still to be accomplished? 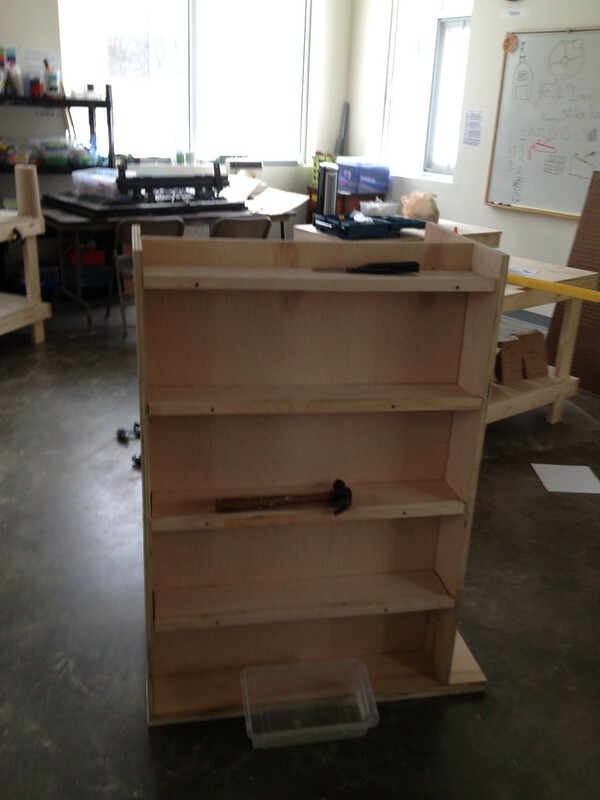 the construction of the remaining three shelves (how significant is it that my Design Lab’s rolling cart for tools and materials has seven shelves? It feels planetary and celestial in some fashion, like the universe is telling me something. A nice synch. Last night I met with some board members and with some other interested folks. I showed some photos of the furniture, and they walked around the stuff in the lab space. I think they were impressed. We’ve designed and built the furniture for our lab space for less than $1300, I think. 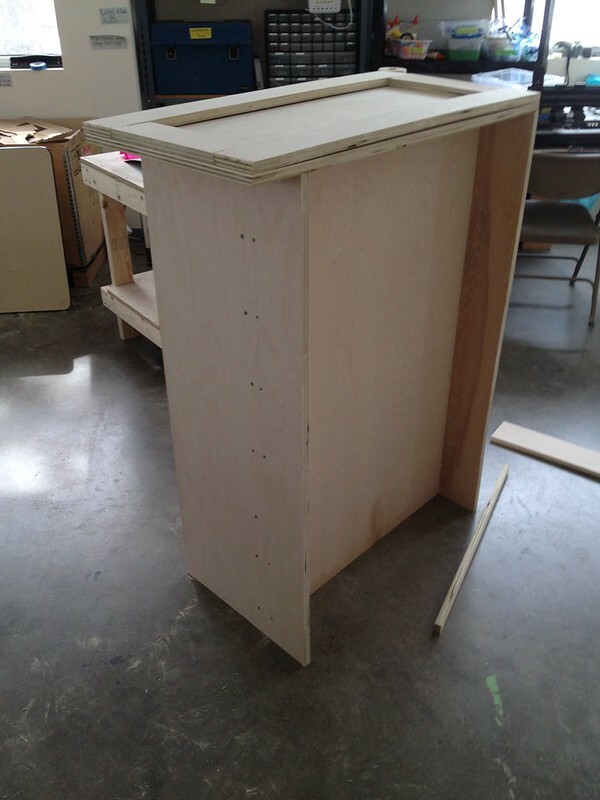 Some of the furniture, like this cart, is going to be a little rough and ready, I have to admit. It could have been built with more care and deliberateness, probably. But that also would have meant waiting for some of our more experienced carpentry team members to be available, and for a good many other things to be accomplished, and probably a larger budget for tools and materials, which we didn’t have. But April 1, our move-in date, is not far away. My goal is to have this project finished by the end of the week, so I can get started on the workbench which is going to be one of the key elements of the whole redesign of the space. 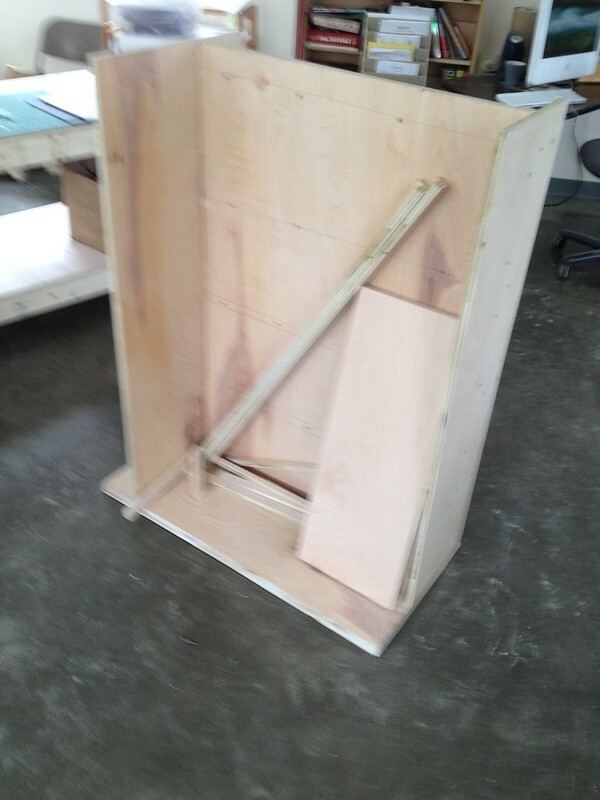 But, as I told the people who came by yesterday, the thing that really pleases me is that we used the space and tools of the old design lab to build the furniture and equipment for the new design lab. And now that we’ve built this super-basic equipment, we can use the tools and equipment and furniture to finish building the design lab to our specifications. In other words, the making of the first few pieces of workshop furniture has enabled us to complete the construction of the workshop. We’ve achieved the virtuous-cycle, of using the first-order equipment to build the second-order equipment. We’re iterating our design, and making improvements, and building out what we envisioned in balsa wood months ago. The design of the cart comes from Plansnow.com.